The Debut of the Most Famous Mouse in the World -- Now in Gorgeous Gold! As the stage lights came down at New York City's Colony Theater on the evening of November 18th, 1928, the audience had only a slight idea of what was in store for them. Two animators, striking out on their own after creating a famous series for Universal Studios, had invested everything they could into one final, unique shot at success. Seven minutes later, the audience was drying their eyes and holding their sides after laughing to the first cartoon with fully synchronized sound. With "Steamboat Willie," Walt Disney and Ub Iwerks introduced the world to Mickey Mouse -- and the world wanted more! Today, "Steamboat Willie" is known as the touchstone for Walt, Mickey, animation, film, modern entertainment . . . the list goes on! It's recognized as a vital piece of history as part of the National Film Registry and as a monumental work as part of the Museum of Modern Art's permanent collection. Nearly 80 years of storytelling and culture can be traced to the first spins of the ship's wheel and the first whistles of the song "Steamboat Bill!" A 99.9% Pure American Classic! 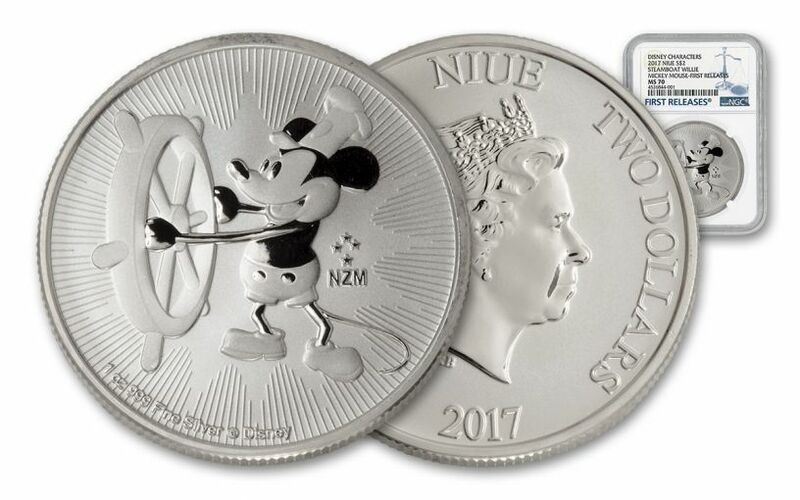 Now, you can bring that landmark scene to your collection with this 2017 Niue One Ounce Silver Disney Mickey Mouse Steamboat Willie Bullion Coin! 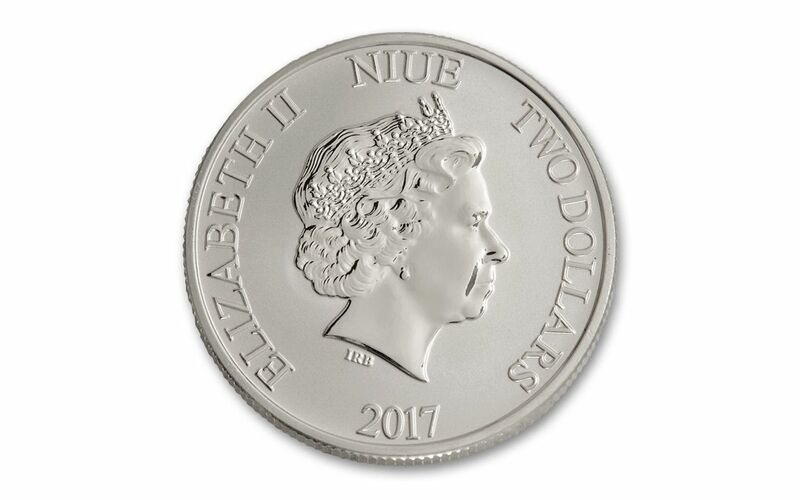 Once again, Disney has teamed up with the New Zealand Mint to create a coin for the ages, minted in one ounce of 99.9% pure silver. 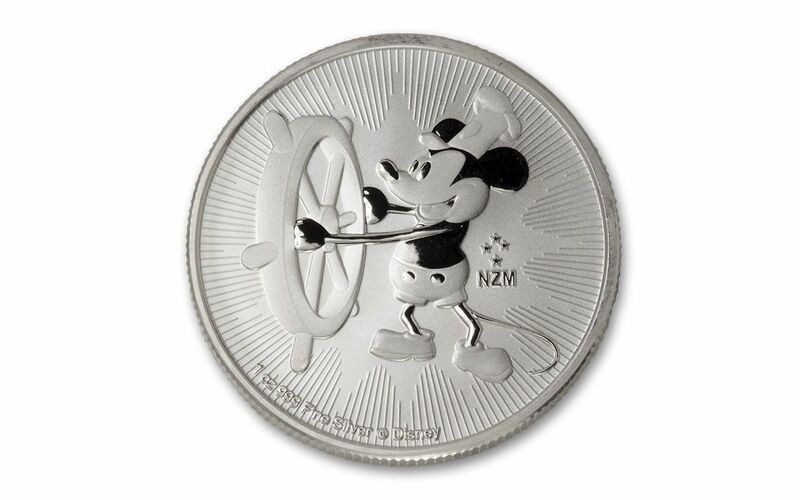 This legal tender two dollar Niue coin features Mickey at the steamboat's wheel, ready to whistle a tune and sound the horns -- right before Pete, the REAL captain, kicks Mickey off the bridge! This detailed recreation is surrounded by a gorgeously engraved burst of lines as well as the mark of the New Zealand Mint. Flip the coin over, and you'll find Ian Rank-Broadley's portrait of Her Majesty, Queen Elizabeth II. Beloved Beautiful Bullion, Famously Fanatical Fans! Your coin will be graded Mint State-70 (MS70) by Numismatic Guaranty Corporation (NGC), a distinction that means your perfectly-graded 2017 Steamboat Willie Bullion Coin will have ZERO imperfections -- showing all features and fields exactly as the engraver and mint intended! 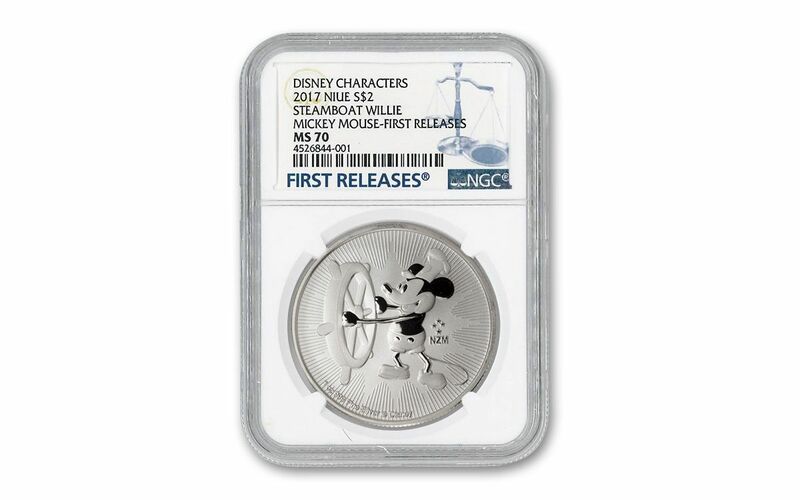 In addition, your 2017 Steamboat Willie Bullion Coin will also be certified First Releases (FR) by NGC, meaning that it was among the first struck by the mint and was certified within the first 30 days of issue. Collectors seek out these coins because they are produced with new dies and considered to have sharper strikes and deeper mirrors than those that are stuck later. Also, the population of coins labeled First Releases is only a fraction of the total mintage! Finally, your coin will be sonically sealed in an acrylic case with a white display core -- giving you the best in protection while granting clear sightlines into every beautiful detail. Disney fans the world over have made quick work of similar coins in the past, and the extremely high quality and purity of these coins are grabbing the attention of audiences of all kinds. Altogether, time is going to be extremely short to make these your own! Don't let this ship pass you by -- hoist a few of these into your cart now!